My husband Fluffy is an only child, so we just assumed that when his parents departed this mortal coil, he would inherit all their earthly possessions. That shows how wrong we were! Although they had never said a peep about such things while alive, after they departed we discovered that they had an extensive estate plan, and that Fluffy was to serve as the executor of it. Although they didn’t forget us, they focused on organizations that did good things. For the most part, we were happy with the way things ended up. Fluffy's parents found good places to put their money. They donated money to the Perpetual Education Fund and the Humanitarian Aid Fund of our church. Primary Children’s Hospital got some money too. How can you complain about losing money you expected to get, when it goes to an organization that educates people in Africa or saves people's lives after tsunamis in Thailand or Japan? You can't — well, at least, I can't. I can't think of anything we would have done with the money that would have spent it any better than that. Do I need a new nightstand more than somebody needs a roof over his head after an earthquake in Chile? I think not. Do we need a car to replace one of our 1999 vehicles more than somebody needs an education, or an expensive medical treatment? No — our 1999 cars are running just fine, thank you very much. We can wait another five years, or even ten. In fact, it took everything in him to carry out that part of the will according to his parents’ wishes. It was not that he wanted the money for himself, mind you. He just wanted to siphon it over to Humanitarian Aid or Perpetual Education or anywhere that did not involve drooling, ball-dribbling and/or ball-passing Neanderthals at his alma mater university. Fluffy’s experiences with the afore-mentioned ball-dribbling and/or ball-passing Neanderthals at his alma mater university were not good ones, you see. Although Fluffy majored in computer science (this was back in the dark ages before most people had even seen a computer), he minored in photography, and also had a part-time job working in the college photography lab. One of his tasks working in the lab was to work with the athletic department and the “deserving athletes” they recruited. These scholarship “students” (and I must put the word in quotation marks) were treated as gods on his campus. They were certainly not on campus to study. They were there to play ball and bring glory (and donations) to the school, and as such nobody cared whether they even cracked a book. Their first big experience on campus was the signing of the contract, which was done with the coaches and the player. Thousands of pictures were taken, as you can imagine. Then they’d depart the photo lab and go out for a big celebratory steak dinner on the university’s dime. The first time Fluffy ever witnessed this rite of passage, he waited until the coaches and the “deserving athlete” had left the premises. Then he turned to the assigned photographer and volunteered to go develop the film. The photographer responded by opening the back of the camera. The camera was empty. There had been no film in it (this was decades before digital cameras). As you can imagine, Fluffy looked at the athletes in his school with a cynical eye after working with them for four years as a photographer. But what drove the final nail in the coffin was when we announced to his parents that we were getting married at the ripe old age of 26. One would assume that having their only child get married would be a red-letter day in the life of any parent. Not so, on this occasion. Fluffy’s parents lobbied, and lobbied hard, for us to change the date of our wedding. The night we had selected, we were told, conflicted with a home game of Fluffy’s alma mater’s basketball team. I have probably written enough in these columns about Fluffy that you know without my having to write it down that the moment Fluffy’s parents told him the reason they wanted him to change the date, the date of our marriage was written in stone. So we got married as scheduled, and his parents were kind enough to attend, even though they would have preferred to be in a stinky gym watching a basketball game. But Fluffy’s father, who is probably where Fluffy got his stubbornness in the first place, got the last laugh. When Fluffy was going through his father’s effects, he found his father’s handwritten journal. In his spidery, old-man handwriting, he had recorded that he and his wife had attended every one of the college basketball home games except one. “Except one” was underlined, maybe more than once. It was perhaps for this reason alone that Fluffy parents had revised their will to include the beloved athletes who had given them so much joy. Bummer. But as I said, Fluffy and I thought the disposition of his parents’ marital assets was a grand idea, with the possible exception of the college scholarships, and the definite exception of the athletic scholarships. Oh, did those athletic scholarships grate on Fluffy. It hurt his sweet little heart to write the checks, but I am proud to report that he did it anyway, because that’s the kind of person he is. He wrote out the checks, he mailed them off, and then he forgot about them. And then an odd thing happened. We started getting thank you notes from the recipients of the scholarships. Not only did we get annual financial reports from each university, but we got individual thank you notes from most of the students who got the scholarships. Some of these were generic, fill-in-the-blank thank you notes, but others were quite heartfelt and touching. We could tell that these scholarships really made a difference in someone’s life, to the extent that their degree might not have been obtained without that help. The years passed, and we continued to get thank you notes from all over Utah. The scholarship endowments in all three schools should be perpetual (the school invests the money and fund the scholarships from the investment returns), so the thank you notes should be continuing to come in for the rest of my life and beyond. Recently Fluffy was going through some of these papers, when he discovered that he had heard nothing from his alma mater since 2013. So he sent an email asking what had been happening with the scholarship endowment at that school. Why had we received no statements or thank you letters for the past two years? And even when we received those reports, why were they not anywhere as thorough as the reports received from the other two universities? Fluffy’s email must have caused a flurry of activity in a little town in northern Utah. Fluffy quickly got an email apology, with the promise that a thorough accounting would arrive in the mail soon. That big packet arrived this week, and it contained details for every year back to when the endowment was funded. The packet also included thank you letters from students that had been written in 2014 and 2015. 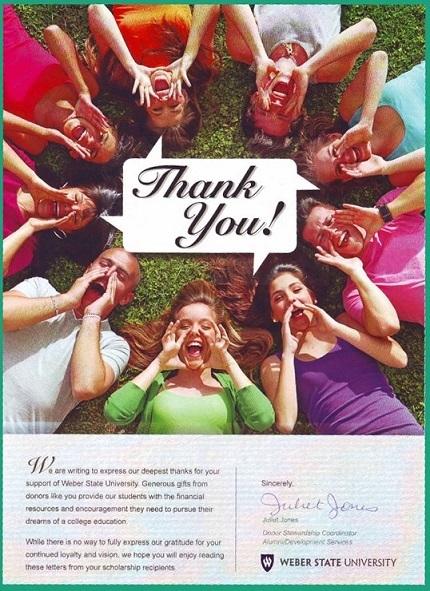 The thank you letters had been sent to the scholarship office at the university, but nobody had ever forwarded them to us. If your mailbox is lonely, just establish a scholarship endowment at your favorite university. Then you will get all kinds of mail from grateful students and scholarship administrators. The letters that nobody had ever bothered to send to us were quite interesting. In fact, once we finally got them they were much more interesting than the ones we had received from the other two schools. One of them was hilarious. The recipient was on the brink of quitting school when she got the scholarship because she could no longer afford to attend classes and indeed almost didn’t open it because she thought it was another bill. It was such a funny note that we thought she should change her major to creative writing. If that letter made us laugh, another letter almost brought us to tears. One man from Sudan was allowed to finish his education because of the scholarship. Many of his family had been killed in civil wars, and attending school in the U.S. was a struggle for him culturally and financially. But he was determined to get his degree and then take his education back to Africa. Both he and one of his professors thanked us profusely for the education that would have been cut short if not for the scholarship that Fluffy’s parents provided. With the updated financial report in hand, Fluffy sat down with a pen and paper to do a little research. He found something that was both interesting and predictable to him. Of the ten scholarships that had been awarded by this university, seven of them were academic and three were athletic. Of the thank you notes he received, all seven of them were for the academic scholarships. There wasn’t a thank you for an athletic scholarship in the bunch. Sure enough, the athletes are those scuzzy, ungrateful lepers. You take their pictures and give them steak dinners and tell them they really don’t have to keep up their grades or follow the rules that everyone else has to follow, and they think the world owes them a living. Scholarships are thrown in their laps, and it doesn’t matter if the people who throw the scholarships in their laps are people who are driving cars that were built in 1999, and who could use the money themselves. They’re athletes, after all. They are owed. The thing is, none of us are owed anything. Fluffy and I weren’t owed an inheritance just because Fluffy was an only child whose parents had money in the bank when they died. The athletes aren’t owed scholarships. We aren’t even owed the air we breathe or the clothes we put on our backs. Everything we have — including the things we work hard to “earn” — is a gift from God. Even the things we think are not especially wonderful (things like my feet that do not walk, for example) are gifts. We can learn great things from them if we will let them teach us. It is up to us to be grateful for the gifts that are given to us as gifts, the gifts that are the products of our sweat and labor, and the gifts that come to us in the form of adversity. All these things ultimately come from God and are for our good. We need to be thankful for all of them, and for the Giver who makes all things possible.